DETROIT (Bloomberg) -- Porsche AG, the sports-car maker merging with Volkswagen AG, will premiere a “spectacular” model when it returns to the Detroit auto show in January after exiting four years ago. Porsche will join VW group presentations beginning Jan. 10 in Detroit that will also include luxury unit Audi and ultra-luxury brand Bentley Motors Ltd., Bode said. Porsche last year delivered a quarter of its 85,903 vehicles to the U.S., its biggest single market. The manufacturer pulled out of Detroit after 2007 to focus U.S. activities on Los Angeles. Detroit has been a mainstay of the North American auto industry for more than a century and is the largest annual U.S. auto show. The company's U.S. deliveries surged 49 percent in November to 2,416 cars and sport-utility vehicles, the sixth consecutive month of at least double-digit sales increases. Year-to-date sales gained 29 percent to 22,753 units. Porsche's Cayman R mid-engine sports car, which sells in Europe for 69,830 euros, premiered last month in Los Angeles. The model, which surges to 100 kilometers (62 miles) per hour in 5 seconds and has a top speed of 282 kilometers per hour, will hit showrooms next spring, Bode said. 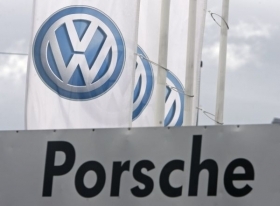 Porsche took another step this week toward its planned merger with Volkswagen after the company's shareholders backed a 5 billion-euro stock sale to lower debt. The sports-car maker agreed to combine with VW in August 2009 after a failed attempt by Porsche to gain control of VW.